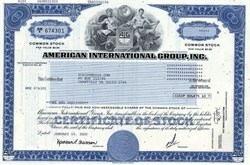 Beautifully engraved certificate from American International Group, Inc. This historic document was printed by the American Banknote Company and has an ornate border around it with a vignette of an eagle. This item has the signatures of the Company’s President and Secretary. The US government Monday unveiled a fresh rescue plan worth 30 billion dollars for AIG to stave off collapse of the ailing insurance company as it revealed massive new losses. The revamped bailout came as American International Group announced a fourth-quarter loss of 61.7 billion dollars -- the biggest in US corporate history -- pushing up its net loss for 2008 to 99.3 billion dollars. The government, which had already pumped some 150 billion dollars into AIG, said the restructured aid package sought to avert a potentially catastrophic collapse of what had been the world's biggest insurer. Officials said a failure at AIG could send new shockwaves through an economy already ravaged by recession. American International Group, Inc. (AIG) (NYSE: AIG) is a major American insurance corporation based at the American International Building in New York City. The British headquarters are located on Fenchurch Street in London, continental Europe operations are based in La Défense, Paris, and its Asian HQ is in Hong Kong. According to the 2008 Forbes Global 2000 list, AIG was the 18th-largest public company in the world. It was on the Dow Jones Industrial Average from April 8, 2004 to September 22, 2008. It suffered from a liquidity crisis after its credit ratings were downgraded below "AA" levels, and the Federal Reserve Bank on September 16, 2008, created an $85 billion credit facility to enable the company to meet collateral and other cash obligations, at the cost to AIG of the issuance of a stock warrant to the the Federal Reserve Bank for 79.9% of the equity of AIG. AIG's history dates back to 1919, when Cornelius Vander Starr established an insurance agency in Shanghai, China. Starr was the first Westerner in Shanghai to sell insurance to the Chinese. After his business became successful in Asia, he expanded to other markets, including Latin America, Europe, and the Middle East. In 1962, Starr gave management of the company's less than successful U.S. holdings to Maurice R. "Hank" Greenberg, who shifted the company's U.S. focus from personal insurance to high-margin corporate coverage. Greenberg focused on selling insurance through independent brokers rather than agents to avoid selling insurance at prices which occasionally became too low (to cover the future payouts) given marketplace competition. A company with agents must pay their salaries even while selling little to no insurance. Instead, with brokers, AIG could price insurance properly even if it suffered decreased sales of certain products for great lengths of time with very little extra expense. In 1968, Starr named Greenberg his successor. The company went public in 1969. In the mid-2000s AIG became embroiled in a series of fraud investigations conducted by the Securities and Exchange Commission, U.S. Justice Department, and New York State Attorney General's Office. Greenberg was ousted amid an accounting scandal in February 2005. The New York Attorney General's investigation led to a $1.6 billion fine for AIG and criminal charges for some of its executives. Greenberg was succeeded as CEO by Martin J. Sullivan, who had begun his career at AIG as a clerk in its London office in 1970. On June 15, 2008, under intense pressure due to financial losses and a falling stock price, Martin Sullivan resigned from the CEO position. He was replaced by Robert B. Willumstad, who had served as Chairman of the Board of Directors of the Company since 2006. Willumstad was forced to step down and was replaced by Edward M. Liddy on September 17, 2008. On September 16, 2008, AIG suffered a liquidity crisis following the downgrade of its credit rating. Industry practice permits firms with high credit ratings to enter swaps with limited margin. When it its credit rating was downgraded, the company was required to post collateral with its trading counter-parties, and this led to an AIG liquidity crisis. The London unit of the world's largest insurer (by assets) sold credit protection Credit default swaps (CDS) on collateralized debt obligations (CDOs) that had declined in value. The United States Federal Reserve, to prevent the company's collapse, and in order for AIG to meet its obligations to post additional collateral to credit default swap trading partners, announced the creation of a secured credit facility of up to US$85 billion, secured by the assets of AIG subsidiaries, in exchange for warrants for a 79.9% equity stake, the right to suspend dividends to previously issued common and preferred stock. AIG announced the same day that its board accepted the terms of the Federal Reserve Bank's rescue package and secured credit facility. This was the largest government bailout of a private company in U.S. history, though smaller than the bailout of Fannie Mae and Freddie Mac a week earlier. On October 9, 2008, the company borrowed an additional $37.8 billion via a second secured asset credit facility created by the Federal Reserve Bank of New York. From mid September till early November, AIG's credit-default spreads were steadily rising, implying the company was heading for default. On November 10, 2008, the U.S. Treasury announced it would purchase $40 billion in newly issued AIG senior preferred stock, under the authority of the Emergency Economic Stabilization Act's Troubled Asset Relief Program. The Federal Reserve Bank of New York (FRBNY) announced that it would modify the September 16th secured credit facility; the Treasury investment would permit a reduction in its size from $85 billion to $60 billion, and that the FRBNY would extend the life of the facility from three to five years, and change the interest rate from 8.5% plus the three-month London interbank offered rate (LIBOR) for the total credit facility, to 3% plus LIBOR for funds drawn down, and 0.75% plus LIBOR for funds not drawn, and that AIG would create two off- balance-sheet Limited Liability Companies (LLC) to hold AIG assets: one will act as an AIG Residential Mortgage-Backed Securities Facility and the second to act as an AIG Collateralized Debt Obligations Facility. Federal officials said the $40 billion investment would ultimately permit the government to reduce the total exposure to AIG to $112 billion from $152 billion. AIG's share prices fell over 95% to just $1.25 on September 16, 2008, from a 52-week high of $70.13. The company reported over $13.2 billion in losses in the first six months of the year. AIG's Financial Product division headed by Joseph Cassano had entered into credit default swaps to insure $441 billion worth of securities originally rated AAA. Of those securities, $57.8 billion were structured debt securities backed by subprime loans. CNN named Cassano as one of the "Ten Most Wanted: Culprits" of the 2008 financial collapse in the United States. As Lehman Brothers (the largest bankruptcy in U.S. history) suffered a major decline in share price, investors began comparing the types of securities held by AIG and Lehman, and found that AIG had valued its Alt-A and sub-prime mortgage-backed securities at 1.7 to 2 times the rates used by Lehman. On September 14, 2008, AIG announced it was considering selling its aircraft leasing division, International Lease Finance Corporation, in an effort to raise necessary capital for the company. The Federal Reserve has hired Morgan Stanley to determine if there are systemic risks to a failing AIG, and has asked private entities to supply short-term bridge loans to the company. In the meantime, New York regulators have approved AIG for $20 billion in borrowing from its subsidiaries. On September 16, AIG's stock dropped 60 percent at the market's opening.The Federal Reserve continued to meet that day with major Wall Street investment firms to broker a deal to create a $75 billion line of credit to the company. Rating agencies Moody's and Standard and Poor's downgraded their credit ratings on AIG's credit on concerns over continuing losses on mortgage-backed securities, forcing the company to deliver collateral of over $10 billion to certain creditors. The New York Times later reported that talks on Wall Street had broken down and AIG may file for bankruptcy protection on Wednesday, September 17. Just before the bailout by the US Federal Reserve, AIG former CEO Maurice (Hank) Greenberg sent an impassioned letter to AIG CEO Robert B. Willumstad offering his assistance in any way possible, ccing the Board of Directors. His offer was rebuffed. On the evening of September 16, 2008, the Federal Reserve Bank's Board of Governors announced that the Federal Reserve Bank of New York had been authorized to create a 24-month credit-liquidity facility from which AIG may draw up to $85 billion. The loan is collateralized by the assets of AIG, including its non-regulated subsidiaries and the stock of "substantially all" its regulated subsidiaries, and has an interest rate of 850 basis points over the three-month London Interbank Offered Rate (LIBOR) (i.e., LIBOR plus 8.5%). In exchange for the credit facility, the U.S. government will receive warrants for a 79.9 percent equity stake in AIG, and has the right to suspend the payment of dividends to AIG common and preferred shareholders. The credit facility was created under the auspices of Section 13 of the Federal Reserve Act. AIG's board of directors announced approval of the loan transaction in a press release the same day. The announcement did not comment on the issuance of a warrant for 79.9% of AIG's equity, but the AIG 8-K filing of September 18, 2008, reporting the transaction to the Securities and Exchange Commission stated that a warrant for 79.9% of AIG shares had been issued to the Board of Governors of the Federal Reserve. AIG drew down US$ 28 billion of the credit-liquidity facility on September 17, 2008. On September 22, 2008, AIG was officially removed from the Dow Jones Industrial Average. An additional $37.8 billion loan was extended in October. As of October 24, AIG has drawn a total of $90.3 billion from the emergency loan, of a total $122.8 billion. Maurice Greenberg, former CEO of AIG, on September 17, 2008, characterized the bailout as a nationalization of AIG. He also stated: he was “bewildered” by the situation and was at a loss over how the entire situation got out of control as it did. On September 17, 2008, Federal Reserve Bank chair Ben Bernanke asked Treasury Secretary Henry Paulson join him, to call on members of Congress, to describe the need for case for a congressionally authorized bailout of the nation's banking system. Weeks later, Congress approved the Emergency Economic Stabilization Act of 2008. We can’t keep doing this, both because we at the Fed don’t have the necessary resources and for reasons of democratic legitimacy, it’s important that the Congress come in and take control of the situation. The following week, AIG executives participated in a lavish California retreat which cost $444,000 and featured spa treatments, banquets, and golf outings. It was reported that the trip was a reward for top-performing life-insurance agents planned before the bailout. Less than 24 hours after the news of the party was first reported by the media, it was reported that the Federal Reserve had agreed to give AIG an additional loan of up to $37.8 billion. AP reported on October 17 that AIG executives spent $86,000 on a luxurious English hunting trip. News of the lavish spending came just days after AIG received an additional $37.8 billion loan from the Federal Reserve, on top of a previous $85 billion emergency loan granted last month. Regarding the hunting trip, the company responded, "We regret that this event was not canceled." An October 30, 2008 article from CNBC reported that AIG had already drawn upon $90 billion of the $123 billion allocated for loans. On November 10, 2008, just a few days before renegotiating another bailout with the US Government for $40 billion, ABCNews reported that AIG spent $343,000 on a trip to a lavish resort in Phoenix, Arizona. On October 22, 2008, those creditors of Lehman Brothers who bought credit default swaps to hedge them against Lehman bankruptcy settled those accounts. The net payments were $5.2 billion even though initial estimates of the amount of the settlement were between $100 billion and $400 billion. In the United States, AIG companies are the largest underwriters of commercial and industrial insurance and AIG American General is a top-ranked life insurer. AIG owns AIG American General, a life insurance company based in Nashville, Tennessee. AIG sold auto insurance policies through its subsidiary unit, AIG Direct (aka aigdirect.com). The policies they offered included insurance for private automobiles, motorcycles, recreational vehicles and commercial vehicles. Pakistan Principal office is in Karachi and branch offices are in Karachi, Lahore, Islamabad, Faisalabad and Sialkot. Selling automobile insurance in Pakistan since 1949. China AIG owns 19.8% of People's Insurance Company of China (PICC) through direct and indirect holdings. PICC P&C[clarification needed] is China's largest insurer of casualty insurance. Hong Kong AIG's American International Assurance operations include 2.2 million policy holders. India AIG is the minority partner with the Tata Group in two insurance companies in India, holding 26 percent each in Tata AIG Life Insurance Co Ltd and Tata AIG General Insurance Co Ltd.
Philippines AIG owns Philippine American Life and General Insurance Company (Philamlife), the Philippines' biggest insurance company. It has a total asset of P170 billion ($3.6 billion). Philamlife serves over a million customers and maintains the widest network of over 200 offices and sales agencies nationwide. Philamlife, on October 3, 2008, announced it is among the assets being sold by AIG to pay off debt to the U.S. government: "it had been identified for possible divestment along with some of its affiliates." AIG identified Philamlife as one of "extremely valuable" assets intended for sale. Philamlife president and CEO Jose Cuisia Jr. said in a statement: "Philamlife remains to be (a) stable and strongly capitalized organization. Our policy owners and clients can be assured that their interests are protected because of the company's financial strength. A change of ownership will not in anyway diminish policy owners' benefits and security. We will remain focused on daily execution of our business and continue to provide our policy owners and clients with the highest levels of service. Philamlife, the largest and most profitable insurance company in the country and the undisputed market leader for over 60 years, is a crown jewel for AIG and will surely attract local and international interest." Cuisia said groups expressed interest to buy Philamlife, including the Yuchengco family which owns Rizal Commercial Banking Corporation. Another possible contender is the formidable Ayala Corporation that owns Bank of the Philippine Islands, Globe Telecom, and Ayala Land among others. Philamlife has total assets of 170 billion pesos ($3.6 billion), also has interests in banking, asset management and outsourcing. But contrary to the report, Philamlife doesn't have any interest on AIG BPSI, an AIG owned outsourcing company based in the Philippines, that services other subsidiary companies of AIG like American General and others. AIA Singapore is a wholly owned subsidiary of AIG in Singapore. It has more than two million policies in force, more than 3,800 financial services consultants and 800 employees in its Singapore offices. General manager Mark O'Dell resigned on September 18, 2008 in response to policy holders queuing up to cash in their policies in the face of concern of the future of AIG. United Kingdom AIG operates in the UK with the brands AIG UK, AIG Life and AIG Direct. It has about 3,000 employees, and sponsors the Manchester United football club. In response to redemption demands, AIG Life (UK) suspended redemptions of its AIG Premier Bond money market fund on September 19, 2008 in order to provide an orderly withdrawal of assets. California AIG owns more than two dozen companies licensed to offer insurance in California, according to the California Insurance Commissioner. They include 21st Century Casualty Co.; 21st Century Insurance Co.; AIG Casualty Co.; AIG Centennial Insurance Co.; AIG Premier Insurance Co.; AIU Insurance Co.; American General Indemnity Co.; American Home Assurance Co.; American International Insurance Co. of California Inc.; Birmingham Fire Insurance Co. of Pennsylvania; Commerce And Industry Insurance Co.; GE Auto & Home Assurance Co.; GE Indemnity Insurance Co.; Granite State Insurance Co.; Hartford Steam Boiler Inspection and Insurance Co.; Insurance Co. of the State of Pennsylvania; Landmark Insurance Co.; National Union Fire Insurance Co. of Pittsburgh, Pa; New Hampshire Insurance Co.; Pacific Assurance; Putnam Reinsurance Co.; Transatlantic Reinsurance Co.; United Guaranty Commercial Insurance Co. of North Carolina; United Guaranty Credit Insurance Co.; United Guaranty Residential Insurance Co.; and Yosemite Insurance Co.
Pennsylvania Twenty AIG subsidiaries are licensed to do business in Pennsylvania, including National Union Fire Insurance Co. in Pittsburgh, believed to be the second largest AIG underwriter in the nation. Other subsidiaries include New Hampshire Insurance, Insurance Company of the State of Pennsylvania, Granite State Insurance and New Hampshire Indemnity. West Virginia AIG writes property and casualty insurance, life and annuity, and workers' compensation insurance in West Virginia. It has 4.7% of the life insurance market and 2.7% of the property and casualty market, as of the end of 2007..
Mortgage lending Since 2001 AIG has owned American General Finance Inc., an Evansville, Indiana firm with $29 billion of mortgage backed assets and more than 1,500 branches nationwide. AIG Tower in Hong KongAIG owns International Lease Finance Corporation (ILFC) , the world's largest aircraft leasing company, with hundreds of aircraft including the full range of Boeing and Airbus jetliners, as well as the McDonnell Douglas MD-11 and MD-80 Series. Total assets under lease are $55 billion as of June 30, 2008. Estimates of its value range from $5 billion to $14 billion based on a comparison with rivals. AIG was one of the owners of London City Airport, along with GE and Credit Suisse. The airport was purchased for £750m in 2006 and AIG reportedly sold its 50% stake for an undisclosed sum on September 30, 2008. Real estate AIG/Lincoln was established in 1997 as a strategic partnership between AIG Global Real Estate Investment Corporation, New York, a subsidiary of AIG - American International Group, New York, and Lincoln Property Company, a Dallas based commercial real estate manager... It has developed or is currently developing over 2.2 million square meters of real estate in Poland, Hungary, Romania, Czech Republic, Germany, Italy, Spain, Switzerland, Austria and Russia. Telecommunications As of August 2007, AIG Investments (through its member company AIG Capital Partners, Inc.) acquired a 90% stake in Bulgarian Telecommunications Company (BTC) from Viva Ventures Holding GmbH and certain minority shareholders. At the time, the estimated value of BTC was 1.7 billion euros ($2.3 billion). Ports As of March 16, 2007, AIG Investments, a division of AIG, completed the purchase of 100% of the stock of P&O Ports North America from Dubai-based Dubai Ports World. At the time, the estimated price was $700m, though AIG did not disclose the exact figure because the number was too low to be deemed significant to the company's asset base. On July 2, 2007, Marine Terminals Corporation became part of the AIG Global Investment Group through its acquisition by AIG Highstar Capital. MTC provides the shipping community with a comprehensive network of stevedoring, terminal operating and related cargo handling services. Terms were not disclosed. Skiing AIG owns Stowe Mountain Resort. AIG's connection to Stowe started when C.V. Starr, the company's founder, invested in the resort in 1946. It is AIG's sole ski business. A $300m, 10 year expansion was started in 2005. Other holdings AIG owns Ocean Finance, a British provider of home owner loans, mortgages and remortgages. AIG is the principal sponsor of English football team Manchester United which is known to be the richest, biggest and most popular sports club in the world and the Japan Open Tennis Championships. In November 2004, AIG reached US$126 million settlement with the U.S. Securities and Exchange Commission and the Justice Department partly resolving a number of regulatory matters, but the company still must cooperate with investigators continuing to probe the sale of a non-traditional insurance product. On June 11, 2008, three stockholders, collectively owning 4% of the outstanding stock of AIG, delivered a letter to the Board of Directors of AIG seeking to oust CEO Martin Sullivan and make certain other management and Board of Directors changes. This letter was the latest volley in what the Wall Street Journal deemed a "public spat" between the Company's Board and management, on the one hand, and its key stockholders, and former CEO Maurice "Hank" Greenberg on the other hand. On October 14, 2004 the New York State Office of Attorney General Eliot Spitzer announced that it had commenced a civil action against Marsh & McLennan Companies for steering clients to preferred insurers with whom the company maintained lucrative payoff agreements, and for soliciting rigged bids for insurance contracts from the insurers. The Attorney General announced in a release that two AIG executives pleaded guilty to criminal charges in connection with this illegal course of conduct. In early May 2005, AIG restated its financial position and issued a reduction in book value of USD $2.7 billion, a 3.3 percent reduction in net worth. On February 9, 2006, AIG and the New York State Attorney General's office agreed to a settlement in which AIG would pay a fine of $1.6 billion. There is an ongoing fraud investigation that has been launched by the FBI after the collapse in stock price.